A. Working from a list of over 100 restaurants, we invite approximately 40 of those restaurants to submit their top burger (beef, turkey, chicken, fish, veggie) for the competition. It is up to the restaurants to decide if they want to enter the ring. Q. 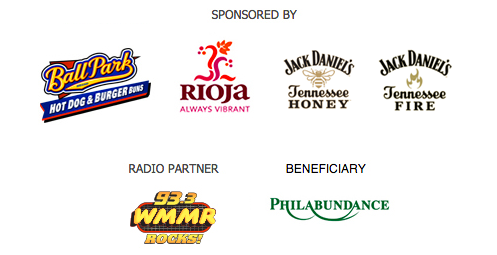 Who will be competing at the Battle of the Burger™ event? A. The restaurants that are voted into the top 20 by the public during the official voting period (July 13th to August 6th) will cook live at the competition on September 14th. Q. When is the official voting period and when will the top 20 restaurants be announced? A. The official voting period is from July 13th to August 6th. The top 20 restaurants from the online voting phase will be announced on August 7th. A. You may vote once every 24 hours. For example, if you vote at 10am on Tuesday, you will not be able to vote again on Wednesday until 10am or later. Q. Help! I’m the only vegetarian in my group of friends. Will I have anything to eat at the September 14th event? A. While we encourage the chefs to feature all types of burgers (not just beef-based), we cannot guarantee that there will be vegetarian options at this event. However, lovers of beef burgers will not go home hungry! A. 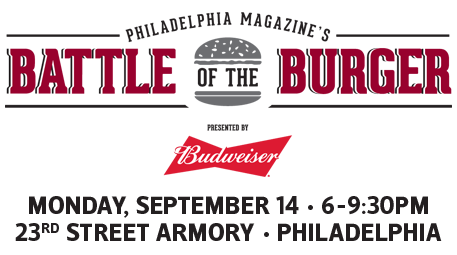 While tasting the top 20 burgers and enjoying Budweiser® are key event highlights, attendees will also have the chance to meet the chefs and see them in full action! In addition, there will be music, photo opportunities, games and activities. This is one of our most popular events, so trust us…you don’t want to miss out! A. Each guest will have exactly one vote chip to cast during the event. After tasting the burgers throughout the evening, guests will submit their one vote for the burger champion. We will tally the votes and announce the Battle winner, along with first and second runner up at the end of the evening on stage. A. We will be giving away a limited number of tickets through social media contests. Follow us @PhillyMagEvents or “Like” us on Facebook to stay on top of our promotions.